If you have been reading my blog over the last couple of weeks, you know that I am totally spicing up my Daily 5 Work on Writing this coming school year. My students will be rotating to five Work on Writing centers throughout the week... working at one center each day. These centers are for more informal practice of writing skills that we are working on and my purpose is for them to be FUN and ENGAGING! We have a separate Writers' Workshop time in the afternoon where we will work on more formal writing projects and we will spend time planning, editing, revising, etc. Now, that is not to say that I will not stress BEST work during the Work on Writing centers as well, but my goals in creating these centers are for my students to LOVE writing and to be creative! Okay, that being said, the Writing Portfolio Center will probably be the "least fun" of all of the centers, but I am soooo excited about the assessment opportunities that it will provide for me. Last week, I made a trip to the Dollar Tree (in my opinion... the "TOP DOG" of dollar stores...) and I bought a binder for each student in my class. I plan to keep the binders and reuse them each school year, so I figure that buying them myself was an investment in my classroom (and binders are not on our school supply list). When the portfolios are finished at the end of the year, I will take out the pages and bind them into a book for the kiddos to take home! This morning, I printed a slapped a little label on the edge of the binder for each student. I have a perfect little spot on a book shelf for the kids to store their portfolios. As a side note, I FINALLY figured out how to PRINT ON LABELS... in the past, I've been using Sharpies to write names on labels because I've been too lazy to find and download a printable template... well, ladies and gentlemen, it is EASY! I don't know why I've been avoiding it the last few years! If you want to pick up these labels, they are Avery 1" x 2 5/8" white address labels, 30 labels per sheet. Here's the link to the free template on the Avery website. Okay, enough about the set-up... I created a writing prompt for each week of the school year. Each prompt is labeled with the # of the week and there is a place for the kids to write the date at the top. There is a place for a picture if the kids would like to draw a picture to accompany their writing. Some of the prompts encourage the kids to draw a picture and others do not. The back of each writing prompt page has more lines for the students to continue their writing... and my favorite self-check tool, a quick checklist for the kids to check their writing before adding it to their writing portfolio binder. Here's our fun cover page that my kiddos will color and personalize during the first week of school! This is going to be my source for assessing students' writing weekly. Even if the kids miss a week at the center here and there, I will have TONS of writing samples to see their progress over time! 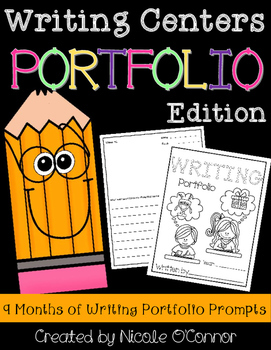 Okay, so my Writing Center: Yearlong Writing Portfolio is up in my TPT store. I designed this writing portfolio with first graders in mind, but it would be appropriate for most lower elementary classrooms! Can't wait to get this up and rollin' this year! Enjoy! I love how prepared you are for writing! It all looks great! Not sure if Notebook Know How would be a good book for firsties, but I used it everyday when I taught 3rd grade. It gave me tons of strategies for writing. I hope you have a great beginning this year!